You know what it feels like when you spot an arts organisation that seems to have little or no relationship with its surroundings. I’m not just talking about the physical environment; rather the glossy 30 page brochure that looks out of place, the tone of communication jolting in comparison to the local lingo and the experience feeling like you’ve entered a vortex. This is an article about placemaking marketing. I’m not suggesting that the arts shouldn’t transform the participant, shouldn’t inspire a new experience nor should they be dumbing down their offer. Rather, as I’ll explain, how galleries, theatres, museums and the like can all embrace their geographical routes to the benefit of both their local and traveling audiences. In the London borough of Islington, at a recent Marketing Network event hosted with Creative Islington, I facilitated a discussion with a mix of marketing professionals from various cultural and creative venues. 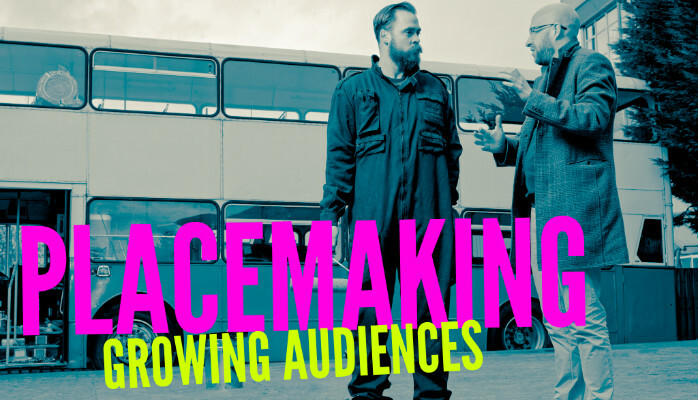 The focus was on ‘Place’ / placemaking marketing – how we as marketers utilise our immediate geography to improve the positioning and presentation of various artistic offers. Venues that manage to combine both a local and visiting audience have an incredible atmosphere; they feel familiar in the surroundings yet attract visitors from far and wide creating a tangible energy. Get this balance right and you will generally find your local audience are fiercely loyal and amazing advocates for your future ambitions. One of the interesting themes of our discussion was that going local doesn’t need to be expensive. We explored a feature published by Lincoln Drill Hall, aptly titled ‘Social Media – But in the Real World’. They have developed a community rep model or as one participant summarised it the ‘Key Man’ – a phrase common with club night promotion where key men would open up communication with various audience groups. By asking their locals to nominate themselves for a patch (be it a physical street or a collection of local restaurants), the community reps distribute their monthly highlight poster and take pride in telling people why they like visiting Lincoln Drill Hall. More than a push campaign activity, they also act as an ear in the community. Every 6-8 weeks they’re invited to a lunch at the arts centre and are given the chance to raise concerns, discuss new ways of working and hear actions from previous discussions. Language was another hot topic. Far too many arts organisations miss out local references in their communications (visual and text). If you’re based in Westminster and trying to reach a local audience, you wouldn’t tell them to turn right at the north end of the Palace of Westminster – you’d use the more commonly known reference to ‘Big Ben’. The same applies to reaching your local environment, don’t be stickler for detail – if there’s a local way of describing a landmark (or even your building) use it, use nicknames and local sayings, using the local vernacular to your benefit. A smart example of a campaign that utilised the sentiment of their locality was a film festival in neighbouring borough, inHOUSE Festival. The festival is based in Haringey’s emerging arts quarter based in a former textile manufacturing area in the south of the borough. Aware that some local residents, outside of the warehouse community, had negative preconceptions of the warehouse tenants, they launched a small, but sentiment filled video trying to bridge the gap between the ‘us’ and ‘them’ divide. Utilising visual references recognisable to anyone in the borough, along with local community figures, they were able to ignite emotion in the viewer to consider the similarities through a focus on place. – Democratisation – empowering your local audience to be part of the decisions making. Platform, in Islington, is a great example where both the physical build and the content of the activity is led entirely by local young people. Further afield, the National Theatre of Wales created a yearlong project the ‘Theatre Map of Wales’ –listen to John McGrath explain more. And Fierce Festival, who in the late 00’s trailed programming led by the public from an opportunity to have ‘Your Name in Lights’ to voting on the content of the Festival. – Estate Agents (before you switch off, read on!) – Estate Agents might have a chequered reputation, but they are certainly great at utilising local references to paint a tempting picture. In recent years this has become common place in how they sell a property. Next time you’re passing an estate agents window, take a moment to consider how you could entice a visitor based on the same attention to detail of the whole experience your locality offers. – Geo-specific Offers – we’ve all got better at personalising content to our audiences, which is great, but it’s even easier to do the same for our local community. One top tip is offering a deal for residents on a specific street – make it clear this is just for residents of a specific street. It does more than flog an offer, it shows them you know who they are, where they live and that they matter to your organisation. Whatever you do, the first place to start is opening your eyes and ears to your local environment. I work with clients from across London to run listening exercises. A few examples included Haringey Arts and Pallet Paradise. The solutions are often simple and cost effective, as they are based on what the audiences they are trying to engage want. So tomorrow morning on your walk to work have a think about how the people you pass might see your organisation and whether now is the time to make a tweak to offer them something new.